Again celebrating the boys in blue, 2016 Futera Unique Manchester City is essentially a team-specific offshoot of World Football Unique 2016. Every pack includes one jersey card or limited insert for a Manchester City player. Taking a comprehensive cardboard approach to City, the 50-card base set touches on the past, present and future of MCFC. The base set also contains coaches. Rare parallels include Silver (#/11) and Gold (#/6) versions of select base cards. Averaging one per pack, 2016 Futera Unique Manchester City gives fans of the Citizens several premium inserts to chase. Memorable Dual Memorabilia cards (#/29) feature 16 players while the Kitcard Dual/Triple Memorabilia (#/15) cards showcase either two or three relics for 14 players. Doubling up, National Heroes Dual Memorabilia (#/15) inserts combine two players, and two relics, on the same card, with eight different combo cards. Each of the memorabilia cards utilizes game- or training-worn swatches as well as the "Code for Collectors" which provides complete details about the item in question. 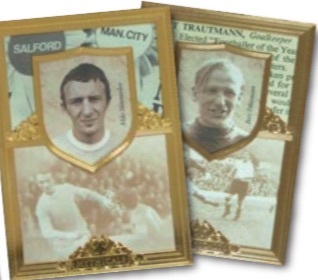 More limited options in 2016 Futera Unique Manchester City include The Mythicals (#/6), a gold-plated memorabilia card for 14 of the all-time greats in the club's history. There are also rare Threads Autograph Memorabilia cards. Finally, Production Sets offer one-of-one pieces from throughout the printing process, including plates and proofs. While Futera Unique is usually a more limited affair, this is especially true for 2016 Futera Unique Manchester City as just ten total cases were produced. Collectors can also find a similar set for Arsenal.